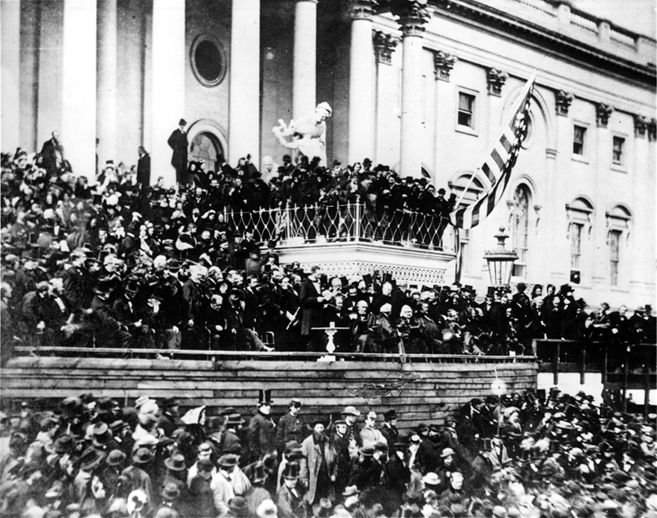 This image is actually a mix of two legitimate pictures of Lincoln’s second inauguration. I made it in Photoshop to place John Wilkes Booth in his correct place in the crowd, using the best image of him available. 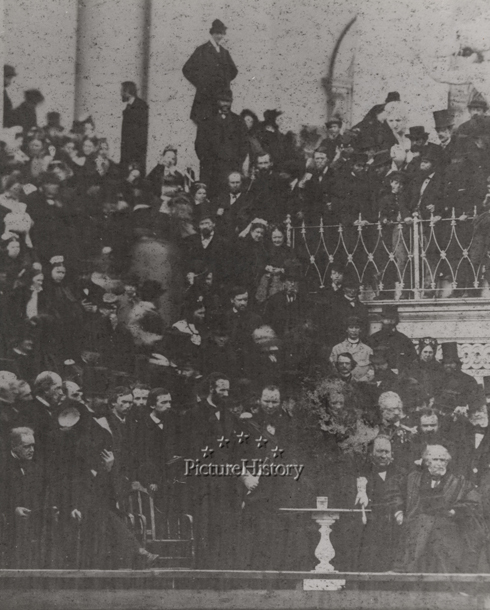 There are several images of Lincoln’s inauguration, but only two (that I currently know of) clearly display John Wilkes Booth in the crowd. Websites (like Wikipedia) and institutions (like Ford’s Theatre) have incorrect displays of “Booth” at the inauguration due to the fact that they are using the best image of Lincoln, which is also the worst image of Booth. Before getting into all that, however, let’s discuss the history of these “Where’s Waldo?” photos. 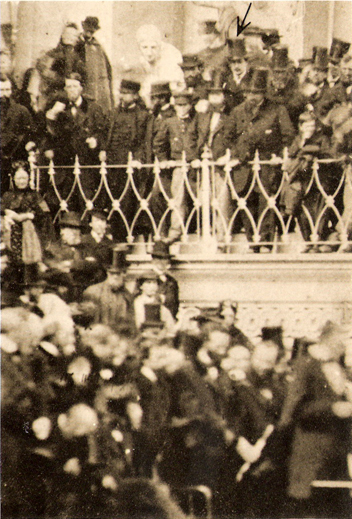 This image is the most common photograph of Lincoln’s inauguration. In fact, practically every search for Lincoln’s second inauguration will provide you with his picture. Some websites even erroneously state that this is the only photograph of the event because it is used so exclusively. The reason for its exclusivity is because this is the best photograph of Lincoln. It shows the President addressing the assembled crowd in all his glory. Of all the images that were taken of the event, this one was the best. This is the man identified by Meserve in 1956 as being John Wilkes Booth. Admittedly, there is no way to guarantee that this is Booth. Honestly, the man who discovered it in the first place was quite old when he published it for the first time. Nevertheless, the man Meserve identified does bear a similar appearance to the dapper, ivory skinned, mustachioed actor that would later assassinate the President. While it’s impossible to truly identify him as Booth, historians have accepted Meserve’s identification and have since included fun footnotes in their books about Lincoln and Booth appearing in the same photograph. The difference between the common inauguration photo and this one is that the focal point is not on the President at the podium but, oddly enough, on the crowd above him where Booth is standing. This image provides the best detail of the man who would be Booth. It is this image, merged with the common inauguration photo, that I used to create the blog’s current header image. The man they have highlighted as Booth, is not the same man we have seen in the other photos as being Booth. This man has longer hair and is wearing no hat of any kind. Attending such an important event without a proper hat, no matter how much he disliked the President, was a social faux pas that the ornate and vain John Wilkes Booth would never commit. This man highlighted on the display at Ford’s and on many websites as Booth is not correct. Booth is partially obscured by the gentlemen in front of him straining to hear. Only his hat and the top of his head are visible, but he is still there. I hope that this post outlines the misconceptions about John Wilkes Booth at Lincoln’s second inauguration. We know he was there and witnessed the event. There is no guarantee that he is present in any of the inaugural photos, though. The identification made by Frederick Hill Meserve is a theory, like anything else. In my eyes, it is a decent one. The man Meserve says is Booth, looks like Booth to me. I wouldn’t bet my life on it, but it’s a harmless enough theory to support. Great, great, interesting story. Thanks Dave. Please solve the mystery of what happened to Corbett’s pistol next. Thank you kindly, Rich. There may even be other exposures of Lincoln second inauguration out there that show Booth even more clearly. For now these are the only ones I know of. In regards to Corbett’s pistol, I figure if Mr. Miller hasn’t found it by now, it’s lost for good. It’s probably just in some generic gun collection somewhere with complete anonymity. great information here…..i have wondered that about the famous lincoln image…..multiple sources have identified different people as booth…….even the pbs 2009 documentary that even features lincoln author james swanson in it even does the photo mix up thing. Thanks… I helped in a minor way to back the production of Saving Lincoln and appreciate your scholarship. A question arises as to whom or which we shall give greater credence: unverified suppositions by some, e.g. the Kunhardts, that this or that person in the balcony is Booth, when even the Ford’s Theatre Museum is criticized for getting it wrong, and considering that there were thousands of men in Washington at that time and on that day who wore top hats and who were mustachioed, and probably thousands, too, who resembled Booth in some degree, or the “dozen or more affidavits” (per Oldroyd)attesting to the fact that the man who tried to break through the police cordon escorting the President from the Rotunda to the portico was Booth. The Kunhardts, it should be mentioned, believe they can identify Powell, Atzerodt, Herold, Surratt and even “Edward” (sic) Spangler (who was NOT a conspirator) in the Gardner photographs. It should be mentioned, too, that there is evidence elsewhere that the Confederate underground planned an attempt on Lincoln’s life on Inauguration Day. A dozen affidavits are entitled to more weight than guesswork, are they not? No mention of the conspirators standing near the bottom of the platform where Lincoln spoke? 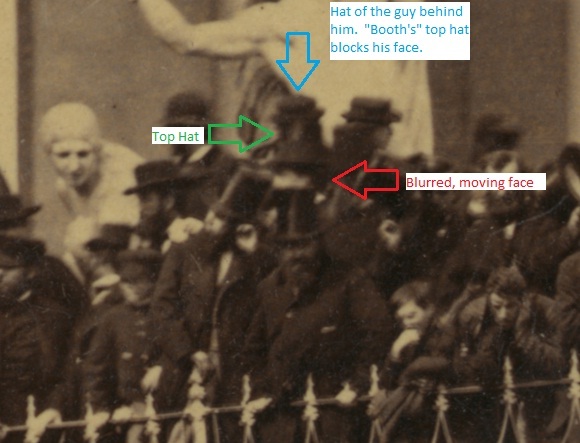 Clearly, John Surratt, David Herald, George Atzerodt and possibly Edmund Spangler are seen. While the book, Twenty Days by Dorothy Meserve Kunhardt expanded on her father’s identification and posits the other conspirators are present in the photos of Lincoln’s second inauguration, there is little evidence that any of the men were there. The men claimed to be Surratt, Herold, Atzerodt, etc. look very little like the conspirators. I second Dave. This is especially true (for me anyway) due to the identification of Spangler being there with the others. Spangler was not part of this group; I don’t think he even met any of Booth’s “people” (other than Booth himself) until after he was arrested and imprisoned. A fascinating example of careful studying of photos and their presentation. I do believe Booth was at the inauguration, but I have reason to believe that he might have (at some point) been closer to Lincoln than these photos suggest (after all, he was separated by dozens of people on the balcony overlooking Lincoln and the dignitaries and the crowds blocking the exit from the balcony to the main balcony where Lincoln was delivering his speech. 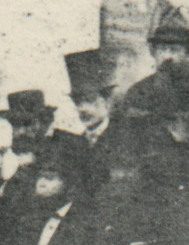 A number of years ago a large hitherto undiscovered photo of Lincoln on the grandstand before delivering the speech finally showed up – showing his own beard trimmed far closer by his barber than normal. Although the images (by our standards) were blurry, Lincoln, Chief Justice Chase, outgoing Vice President Hannibal Hamlin, and Vice President Andrew Johnson were clearly visible and sitting together up front. But while I looked carefully at the picture, on the side (say within twenty-five feel of the President) is a top hatted man with a moustache who resembles Booth! If it was him, he did get within striking distance of Lincoln. Could he have briefly actually been that close to the President? Well, if you think about it from the point of view of the date and Booth’s connections it was possible. Booth, at the time, was engaged to Lucy Hale, daughter of Senator John Hale of New Hampshire, who was a supporter of the administration. 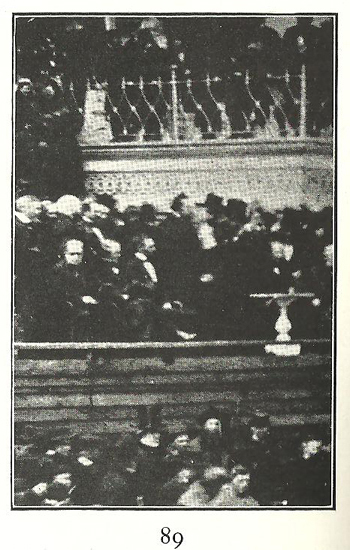 He could have gotten a pass for Booth to attend the inauguration, and Booth could have wandered down near the President, but possibly was asked to go to the smaller balcony because that was where his pass entitled him to stand. Since the inauguration was in March 1865, the stigma of the assassination had naturally not been connected to Booth yet – it was six weeks later. His dislike of the North and Lincoln might have attracted some attention – but given his connection to the Hales it was somewhat muffled. Also, he had not yet given up on kidnapping Lincoln to help the Confederate cause. When he was near Lincoln (if it was Booth) he would not have been prepared to kill the President – he might just want a close look at him. His comments to Samuel Chester were basically given AFTER he heard the Second Inaugural Address, not before, and while he might detest Lincoln’s abolitionism he was not prepared for Lincoln coming out for support of African-American suffrage and equality. At that point Booth’s fanaticism would have started heading for more murderous solutions. But it still was concentrating on kidnapping until April 2, 1865 when Richmond fell, and April 9, 1865 when Lee surrendered. The scheme still had rapidly weakening possibilities until those dates. I don’t think on March 4, 1865 Booth was ready, despite physical proximity to Lincoln, to kill him. Great detective work on JWB at Lincoln’s second Inaugural. I believe the man in that silk hat is Booth, and the man whose head is turned is also Booth. Congratulations on finding him in that shot. 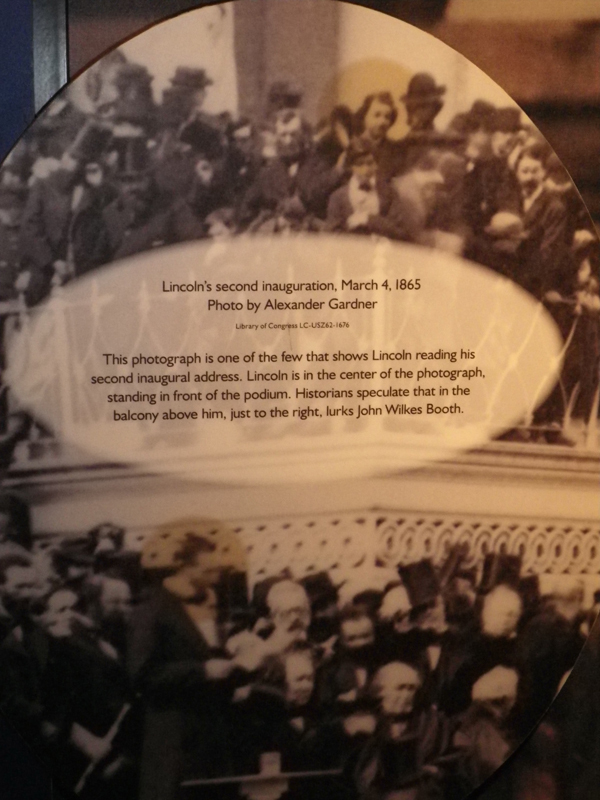 Also good of you to point out that “Killing Lincoln” did some photo magic and placed Booth elsewhere in the crowd. I detest that sort of thing. It was also done on a documentary a few years ago — perhaps “Stealing Lincoln’s Body” — they created a new image of Lincoln’s face in his casket at NY’s City Hall, and today it is widely shown and published as though it is a legitimate image of Lincoln in his casket, which it isn’t. The same can be said about the close-up of Teddy and Elliot Roosevelt looking out the window at Lincoln’s funeral procession. That is also a photo shoppe-type product. Was just reading Gore Vidal Lincoln and went to your site. The photos you’ve included are , indeed, chilling !